Choosing the right solar panel is key to getting the most from your investment. We keep our finger on the pulse of product and industry developments, constantly assessing the solar panels available on the market for both quality and value-for-money. 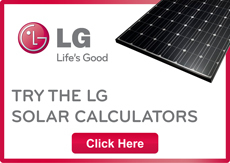 We use and recommend LG solar panels because your investment deserves nothing less than the best. The LG NeOn R is the best of the best. It features an innovative new design which allows for an incredible 38% more electricity per square meter than a standard 160w panel and can also withstand twice the wind load to regular standard panels. ~ The NeOn R is available in 360w panel output. ~ It’s powerful and compact. You can future proof your investment with a high efficiency panel that has the same imprint as a standard panel. ~ 25 years product warranty parts and labour (includes coverage for transport). That’s 15 more years than a standard solar panel. The award winning panel that keeps on getting better! The LG NeOn 2 is one of the most awarded panels, having won Intersolar awards in 2013, 2015 and EUPD Research Top Brand Award in 2016, 2017 and 2018. This panel is a reliable high-efficiency panel and is ideal for homes seeking a visually pleasing solar panel and for roofs where space is tight or where future system expansions are considered e.g. to incorporate battery storage or electric car charging.